Women who work full time in Maine earn about 22 percent less than men who work full time, according to the latest data on the state's work force. Women who work full time in Maine earn about 22 percent less than men who work full time, according to the latest data on the state’s work force. Men tend to earn a lot more than women in such occupations as manufacturing and sales, and a little more in health care support and administrative support, according to the data. The wage gap is only about half as big now as it was in the 1970s, the result of women gradually catching up to men’s salaries and hourly wages, economists say. But it hasn’t gone away. “It’s certainly been moving in the right direction, but it’s been moving very slowly,” said Laurie Lachance, a former Maine state economist who is now president of Thomas College. The lingering income gap is no surprise to many working women. It may be news to a lot of men, however. A poll conducted for The Portland Press Herald in late June found that 66 percent of women said they believe women are paid less than men for the same work. Most men, on the other hand — 53 percent — said they either did not believe women are paid less or weren’t sure. “They have not really faced it or dealt with it,” said Krista Kern Desjarlais, the owner of and chef at Bresca on Middle Street in Portland. Working her way up as a restaurant line cook and chef, she sometimes replaced men who had no more experience — and maybe less — but earned more, Desjarlais said. “I don’t feel like I’ve ever been discriminated against, but I definitely have taken positions where I was paid less than the man who was in the job before me,” she said. The overwhelming data back up Desjarlais’ experience. Sorry, guys; on this subject, at least, the women seem to know what they’re talking about. That’s not good for the economy or the state as a whole, according to Lachance. “When you look at single heads of households, it’s predominantly women, which means that children in that family unit are dealing with lower earnings and a lower standard of living,” she said. The gap also means women — who tend to live longer than men — earn less in their careers to support themselves through their retirement years and are more likely to need public assistance, she said. It’s not just women experts who say the wage gap is real. “The numbers certainly bear out the story that women are earning substantially less than men for what we would consider the same work,” said Ryan Neale, program director for the Maine Economic Growth Council and the Maine Development Foundation. The average Maine woman working full-time earned $33,959 in 2010, according to the latest annual survey data published by the U.S. Census Bureau. That’s 78 percent of what the average Maine man earned — $43,257. In other words, she earned about 78 cents for every dollar he earned. Nationally, woman earned 78.3 percnt of what men earned, according to the survey. That gap is much smaller than it was 40 years ago, when Maine women earned an average of 58 percent of what men earned. Figures from the federal Bureau of Labor Statistics show that women’s wages have been growing faster than men’s over time. The wage gaps for individual occupation categories in Maine are based on survey samples and can change from year to year, but the overall pattern is consistent. In 2010, women in management earned about 83.1 percent of men in management. Women in office and administrative support jobs earned about 87.1 percent of what men earned. In food preparation and service-related occupations — Desjarlais’ business — women earned about 82 percent of what men earned. While the numbers consistently show a gender gap, the census data have their limits. They cannot narrow down the comparisons to people who do identical work, and they don’t account for possible differences in tenure and experience. “The average wages are higher for men than women, but there’s more to the story,” said Glen Mills, director of economic research at the Maine Department of Labor’s Center for Workforce Research & Information. Women, for example, have historically been more likely than men to take breaks from the work force to raise children or care for family members. That translates into less experience and potentially lower earnings well after they return to the work force, Mills said. There also is the continuing gender segmentation in the work force, even within occupation categories tracked by the Census, Mills said. Men tend to occupy the higher-paid jobs in many industries, such as manufacturing, he said. “When you adjust for those things, the gap is smaller,” Mills said. The inability to make exact comparisons and eliminate other factors contributes to the different opinions about whether women are paid less for the same work. “There is probably no right answer,” he said. Susan Feiner, a professor of economics and of women’s and gender studies at the University of Southern Maine, has been studying the gap for years and said the answer is clear. National data shows that the gap exists at every educational level, whether comparing high school dropouts or workers with graduate degrees. In fact, Feiner said, pay disparity in the work force is even bigger than the numbers suggest. “The wage gap, the way it’s calculated (comparing full-time workers) actually way overstates the parity,” Feiner said. The data do not show, for example, that women are much less likely to have full-time, full-year jobs. The fact that more women fill part-time and temporary jobs means women’s overall earnings are even less as a percentage of men’s earnings. “It’s still a man’s labor market,” she said. Desjarlais said that’s slowly changing in the restaurant industry. 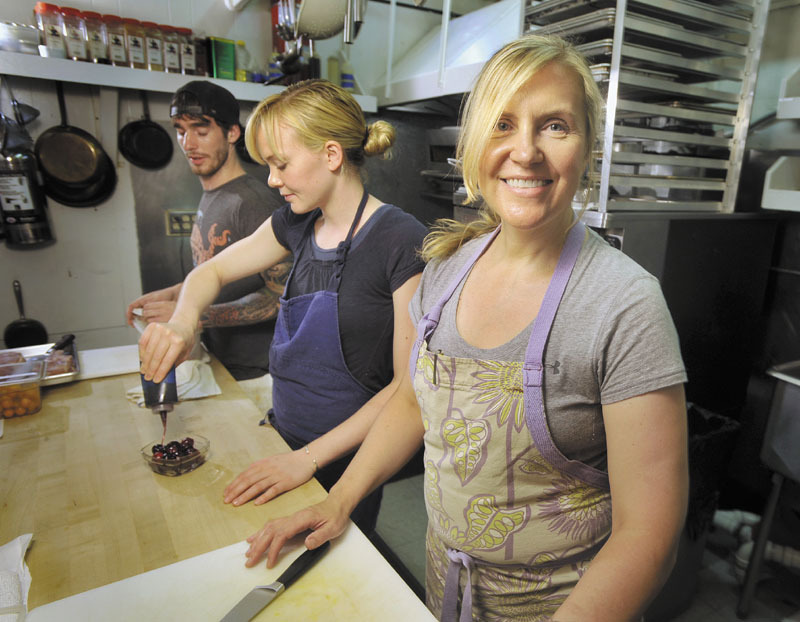 She is one of a growing minority of women chefs. She also is now in the position to hire the cooks and servers, and to set their wages. Desjarlais’ male and female line cooks, Blaine Pitcock and Shelby Stevens, do the same work as each other and earn the same wage, she said. “I feel like I need everyone to be on the same playing field,” she said.